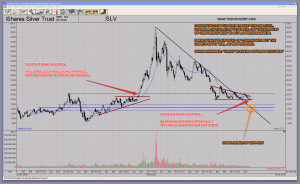 Always up-to-date SLV – Silver ETF chart on my public list. In uptrends, surprise moves tend to be to the upside. In downtrends, surprise moves tend to be to the downside. Interestingly a lot of people who follow precious metals are still in complete denial. When the metals shoot to the upside everything is fine. When the metals are in vicious downtrends the word you hear most often is ‘manipulation’. The following chart shows two classic technical analysis patterns. An ascending triangle and a descending triangle. During bull markets the average gold bug will proclaim that an ascending triangle is a very strong buy signal. During bear markets, you guessed it, ‘technical analysis doesn’t work’. This chart simply looks extremely dangerous. There are no certainties in life and nobody knows if we will get a capitulation sell-off or not. We are in a strong downtrend therefore the odds are stacked against the bulls. There is confluence of support around the 15$ area. If we do witness a vicious sell-off, areas of multiple support tend to act as price magnets. 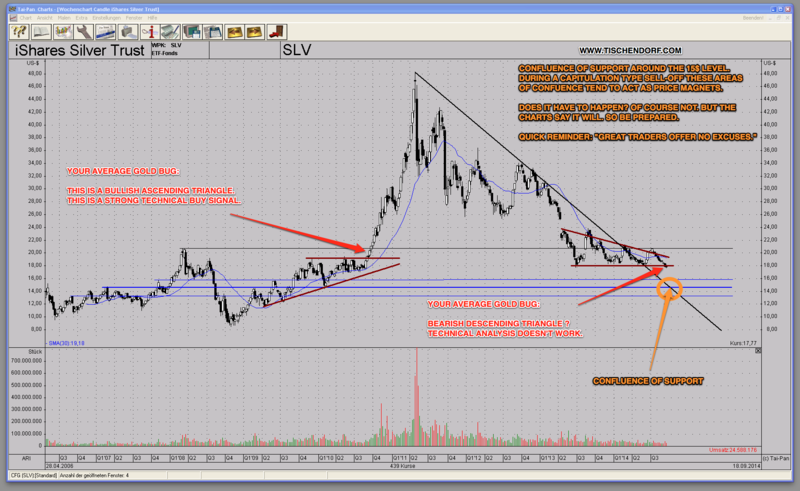 Update 09/19/14: Adding an additional long-term monthly chart from my public list. The bearish head and shoulders pattern is adding a lot of selling pressure. Overall the chart suggests the 15$ price area should be a price zone acting as a very strong magnet.